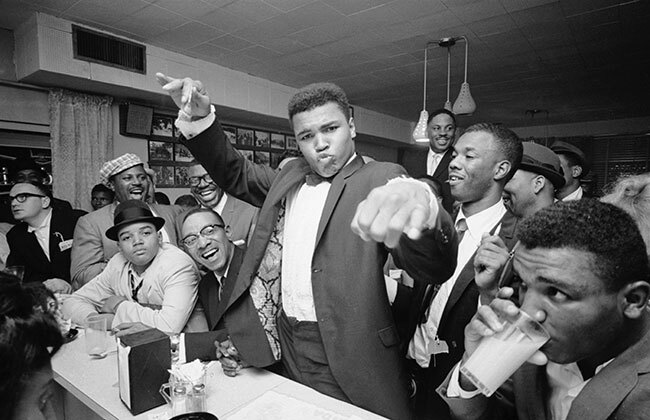 Cassius Clay (later Muhammad Ali) holds court at a diner with fans, friends, and admirers in Miami, March 1, 1964, the week after his defeat of Sonny Liston. (Bob Gomel/The LIFE Images Collection/Getty Images). Thirty-five years ago Muhammad Ali and Red Smith both came to the end of their respective careers. Ali, of course, had spent the better part of two decades as a professional boxer and was the only three-time heavyweight champion of the world. His last fight was on December 11, 1981, in the Bahamas, where he lost a ten-round decision to Trevor Berbick. Smith had been a sportswriter for fifty years, most famously at The New York Herald Tribune with a final decade at The New York Times. One month after Ali’s last fight, he announced he was scaling back his column from four times weekly to three. “We shall have to wait and see whether the quality improves.” He died of heart failure four days later, at the age of seventy-six. During the previous twenty years Smith “had a lot to say about Ali—first crankily negative, later largely positive,” notes Daniel Okrent in the introduction to the LOA’s recent collection of Smith’s columns. What particularly turned Smith (like many of his colleagues) against the young boxer, who had recently changed his name from Cassius Clay, was his statement in early 1966 that he would refuse to serve in the army during the Vietnam War. “Squealing over the possibility that the military may call him up,” Smith wrote, “Cassius makes as sorry a spectacle as those unwashed punks who picket and demonstrate against the war.” He then grudgingly if patronizingly predicted, “Cassius, who can be an extremely attractive young man when he chooses, will be winning and contrite. He has already conceded that he did pop-off out of turn.” Two months later, however, Ali was arrested and convicted for refusing to be inducted into the U.S. military. Smith did eventually change his mind about Ali. On Christmas Day 1981—two weeks before his final column—he named Ali’s retirement the biggest sporting event of the year. Cassius Marcellus Clay fought his way out of the horde that swarmed and leaped and shouted in the ring. . . . If you don't see the full selection below, click here (PDF) or click here (Google Docs) to read it—free!